A video of bubbles freezing at -15 Celsius by Warsaw-based photographer Pablo Zaluska. The video was inspired by a conversation with his 3-year-old daughter after trying to explain to her why she needed to wear a warm jacket on a blistering cold day stating that "It is so cold that even soap bubbles freeze and it looks really beautiful." I saw a sparkle in her eyes so I promised to make a film to show her that. She was so excited about this idea that of course she forgot that she didn’t want to put her jacket on. It wasn’t easy to capture those bubbles because only around 5-10% of them didn’t break instantly and as you can imagine it was a challenge to be patient at -15 Celsius. But it was worth it because now that my daughter has seen it, winter is magic for her. 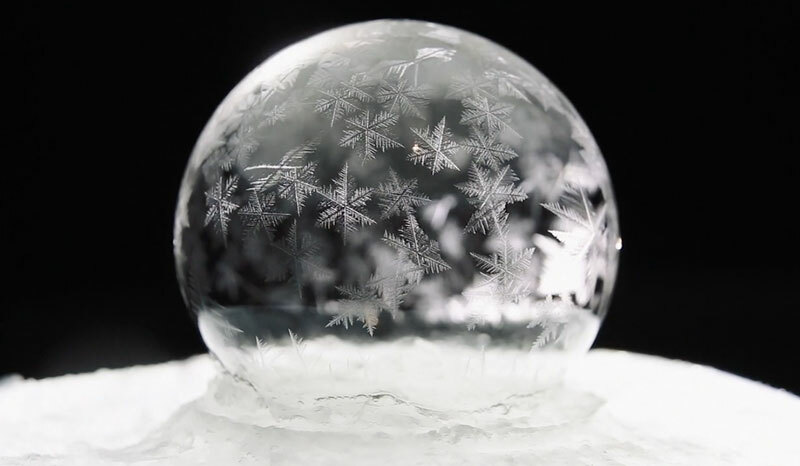 A video of bubbles freezing at -15 Celsius by Warsaw-based photographer Pablo Zaluska.